Successful completion of an induction programme is a statutory requirement for a teacher with qualified teacher status (QTS) to continue teaching in a maintained school or nursery, a non-maintained special school or pupil referral unit, subject to certain exceptions (as set out in government Regulations). 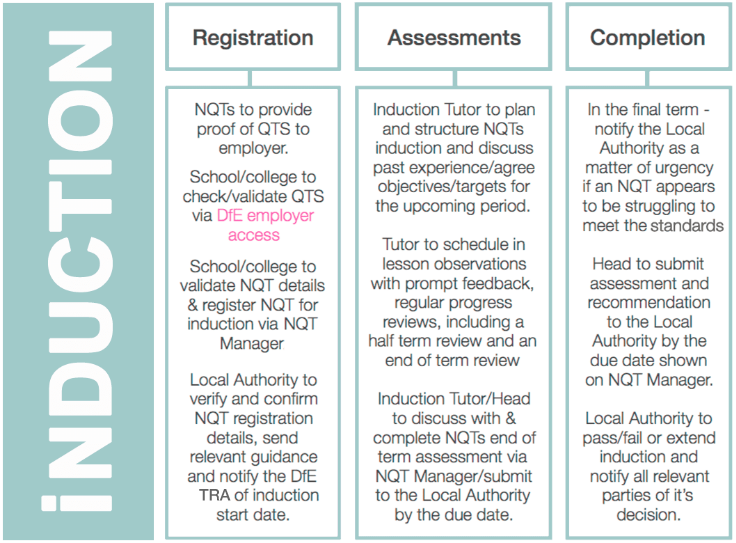 During the induction period an NQT must receive a reduced timetable (10% NQT time), in addition to statutory 10% planning, preparation and assessment time all of which must be protected by law. They must also receive adequate and targeted support. Regulations make it clear that an NQT's duties, supervision, and the conditions under which they work must enable there to be a fair and effective assessment of their conduct and efficiency as a teacher. An important element of this is ensuring that their post is suitable for induction. A suitable post is one which provides them with the tasks, experience and support that will enable them to meet the teaching standards, and which does not make unreasonable demands. The following is a brief outline of the key steps to take in laying the foundation for a successful induction. These steps are explained in greater detail in the following sections and in the supporting links on each page. Please note: Qualified Teacher Status (QTS) is a legal requirement for induction. If a teacher does not have QTS they are not an NQT and therefore cannot undergo NQT induction. Schools/colleges, regardless of status, must by law check details of all teachers via the DfE employer access system. Those teachers who hold QTLS or EYTS are not NQTs and are therefore not eligible for/are exempt from the requirement to complete induction. NB: Supply teachers who hold QTS can undergo induction so long as their contract length is for a minimum of 1 full term. Induction must be pre-planned and take place in a stable environment which cannot happen in a short-term supply role i.e. day-to-day supply.